Despite being one of the more common reasons for consulting a dermatologist, the diagnosis and management of atypical nevi remain nuanced and can often be challenging. I had the opportunity to learn from Dr. Jean Bolognia on her approach to atypical nevi, and walked away with many pearls to share. 1. 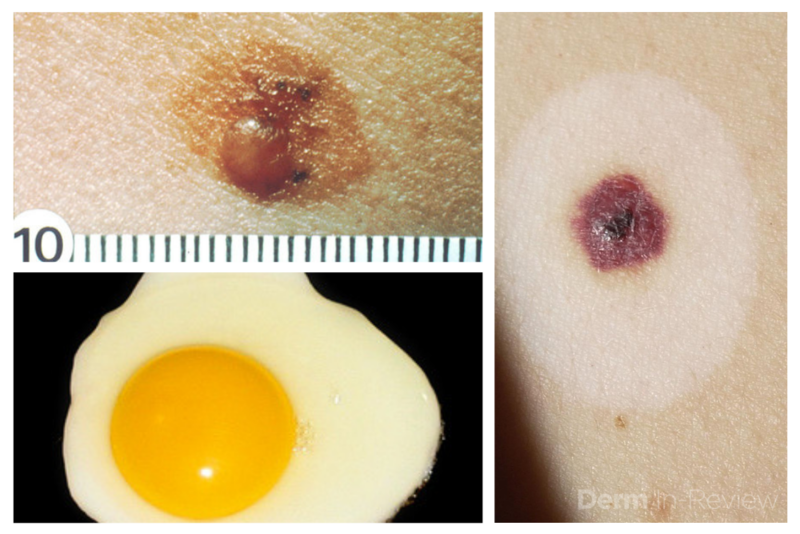 Identify the patient’s signature nevus and come up with a plan. Sometimes it can be overwhelming to know where to begin when tasked with the patient who has numerous and atypical nevi. The first step is to identify the patient’s signature nevus. Do they tend to grow fried egg nevi, eclipse nevi, or cockade nevi? Are their signature moles all pink with little brown pigment, or are they pitch black with a wafer of scale? Identifying the signature nevus assists in determining the ugly duckling, and it will also help you develop a practical approach. In addition, if the patient has primarily pink nevi, palpation for induration versus soft flabbiness is helpful as banal intradermal melanocytic nevi can be pink in color. If the patient has primarily small flat black nevi, you should hone in on the presence of inflammation that is not simply due to acne or folliculitis. Creating an individualized plan is the key to a successful examination. 2. Nevi change, and sometimes it is simply an aging phenomenon. In addition to identifying the signature nevus, it is also essential to understand how melanocytic nevi evolve over time. While nevi classically progress from junctional to compound and then to dermal, sometimes they simply fade away. In the case of fried egg nevi, the “yolk” becomes more raised and softer over time while the “white” of the egg gradually fades (figure 1). This results in multiple large dermal nevi on the trunk in an older patient. 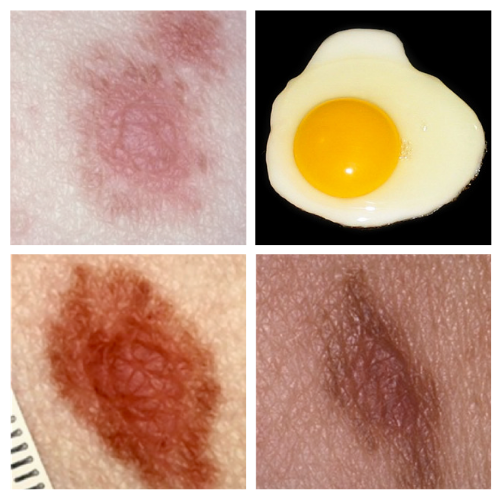 Patients can be taught that when a nevus elevates, determining if the lesion is firm versus soft can assist in distinguishing between the need for evaluation versus an aging phenomenon. Although not all changing nevi are concerning nevi, it is still essential to give the patient’s nevus of concern special attention, even if it doesn’t catch your eye at first. Figure 1. “Fried egg” appearance nevi. Medical images courtesy of Dr. Jean Bolognia. Patients with numerous nevi and multiple atypical nevi are at increased risk for the development of cutaneous melanoma. As a result, they represent life-long patients. When patients have more challenging signature nevi, in particular pink nevi and small black lentiginous nevi, they often require a lower threshold for biopsy. The patient should be informed of this need as it helps to set the tone for future visits and helps to establish a valuable rapport. While education begins on the first visit, it clearly continues during future visits. 4. Two sets of eyes can be better than one. Patients with more challenging signature nevi, especially those with pink nevi and small black lentiginous nevi, not only require a lower threshold for biopsy but can also benefit from alternating examinations by two dermatologists. While criteria for biopsy often differ slightly between two physicians, these differences can be complimentary and thereby benefit the patient. When the reason for this approach is explained to the patient, it is usually well accepted. This information was presented by Dr. Jean Bolognia at the 16th Annual ODAC Dermatology, Aesthetics and Surgical Conference held January 18th-21st, 2019 in Orlando, FL. The above highlights from her lecture were written and compiled by Dr. Daniel Yanes, one of the 5 residents selected to participate in the Sun Resident Career Mentorship Program (a program supported by an educational grant from Sun Pharmaceutical Industries, Inc.). Dr. Yanes was paired with Dr. Jean Bolognia as his mentor. Did you enjoy this post? Find more on Medical Derm here.